Making up for the infusion of sounds, BBC’s minimalistic vocals polish up the style they have been tampering with, successfully so, since 2006. Much like the now-defunct London restaurant they’ve adopted their name from, there’s warm comfort in the familiarity that Bombay Bicycle Club (BBC) instills in an Indian listener. It’s the kind of sentiment that an ’80s or ’90s child probably experienced when, while listening to Poison, Nirvana or The Smiths, she found an occasional Cornershop, brimming with Indian notes fused with British post-punk sounds. 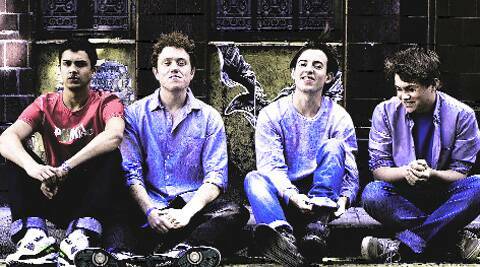 Or chanced upon Goldspot, the British indie-pop outfit known for their “retro filmi” influences. But in So Long, See You Tomorrow, BBC — with Jack Steadman (on vocals, guitar, piano) at the helm, Jamie MacColl (guitar), Suren de Saram (drums) and Ed Nash (bass) — doesn’t just create an easy ambience. It infuses a pinch of blues (used in their debut album I Had the Blues But I Shook Them Loose) and folk tunes (used in Flaws) in its crisp electronic pop soundscape. The first image that comes to mind with the track Feel is the amorous snake dance in the film Nagin (1976). The track starts with the familiar Man Dole Tera Tan Dole’s shehnai tune embellished with booming bass, smoothly progressing to danceable techno pop. Further, there is a brief grungy version of the “Nagin song” interlude, followed by “Our love was lost, oh lost/And then forgotten like an old song/ You said your life went on”. Luna, on the other hand, even though ridden with tabla musings, is a psychedelic mix of female chorus and trance-like sea of sounds. With the intensity reminiscent of the British jazz-electronic outfit, The Cinematic Orchestra, and a wholesome diversity of sounds (Bollywood samples laced with orchestral-quality stringed instrumentals, for instance), Overdone is set against turntablist and electronic elements. Steadman’s restrained vocals, sweeping in and out of occasional chorus, make the track a concert-goer’s dream. Carry me struts heavily with mixed emotions of dub, pop and techno, a repetitive “You carry me” reverberating across the sounds. Tracks such as Home by now, Eyes off you and Whenever, wherever are mellow. Making up for the infusion of sounds, BBC’s minimalistic vocals polish up the style they have been tampering with, successfully so, since 2006. The 10-track album concludes with the titular song So long, see you tomorrow. It’s a clean-cut composition, but goes astray with Steadman’s inexhaustible “When you reign it down, lights come/ You go round and round and round” in loop for six minutes. Once it’s over, So long… leaves one with a disconcertingly bittersweet aftertaste, a good sign of more to come from one of the most underrated bands from London.